How we make our steel is a real kiwi recycling success story. The following outline is to help you to understand the scrap to steel making part of our business. All our scrap is sourced locally and is sorted and shredded on our behalf by Sims Pacific Metals – conveniently located next door to us, their biggest customer. The scrap is placed in piles in our yard, depending on its grade and size. The scrap is then loaded by a grab crane into baskets. Each “heat” is created from three basket loads of Scrap. The baskets are loaded from a recipe sheet. The first basket will hold the most scrap – 20 tonnes plus – and then basket two and three will progressively hold less. The target is 50 tonnes of scrap per heat. The first basket is lowered over the electric arc furnace and the scrap is dropped in. An electrical current is combined with chemical energy to heat the scrap to a near molten state. At this point the second basket is added and once this is also molten, the third and final basket is added. This progressive basket process is required in order to fit all the scrap in one heat. We then inject oxygen and carbon and the process takes the molten metal to a base level, this also enables us to form slag on the top of molten steel. The slag (which contains the impurities we don’t want) the steel effectively bubbles off the top of the heat and is collected in a slag pit below. We process this slag and is reused as high grade roading material all around New Zealand – recycling at its best! When the steel temperature is around 1620 degrees Celsius the molten steel is then poured into a ladle- this is called tapping. During the tapping process we add lime, manganese, silicon, carbon and if necessary depending on what type of steel is being made, vanadium. 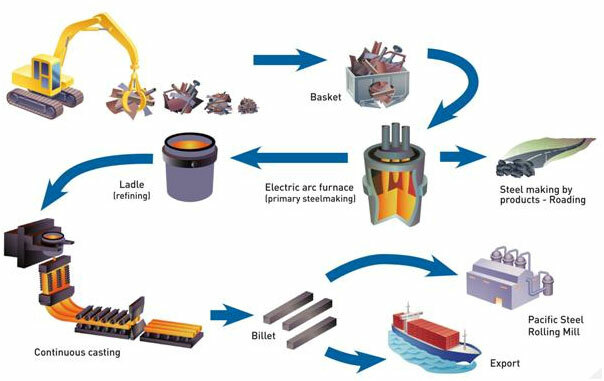 The ladle is then transported by crane to the refining station, where more carbon, manganese, silicon and vanadium are added to achieve the specification of the grade of steel being made. Argon gas bubbles through the ladle to help remove any remaining impurities. Once the specification of the steel is confirmed the ladle is transported again by crane to the continuous casting area. Here the ladle gate is opened and the molten steel is allowed flow in a controlled matter into a tundish. This steel flows into three billet moulds. The steel billets are formed and then cut to the desired length for further processing. The billet is normally consumed by our rolling mill, where it is further processed into rolled products like reinforcing bar or wire rod. Pacific Steel also exports billet – a globally traded commodity. Following on from the scrap to steel billet process above, we now go on to detail what happens to that raw steel billet in our rolling mill. All the steel billet manufactured by the steel plant is categorized by its specific chemical properties and stored in what we refer to as the billet yard. The rolling mill then draws down on this billet by grade depending on the final planned product. Once the appropriate billet grade is determined the billet must be reheated and is loaded into our gas reheat furnace. The furnace is continually loading, so as one billet enters the furnace another that is now fully heated is rolled out ready for the rolling process. The reheat furnace has a capacity of over 150 tones of billet and typically takes two to three hours heat up to the rolling temperature of 1060 degrees Celsius. Thirty six gas burners provide the heat and hot exhaust gas is reused to preheat the incoming combustion air, minimizing any potential for heat loss. The billets are moved through the furnace on a walking beam which lifts the entire furnace full of billets and moves them forward one step at a time. Once heated to the appropriate temperature the billet then enters the continuous bar rolling line. In basic terms the rolling line has three phases - the “roughing” stands or preliminary rolls, which do the initial rough shaping, then the “intermediate” stands which further refine the steel to a more oval shape and finally the “finishing” stands which finally shape the steel to the appropriate size, deformation pattern and shape. The steel can pass through as many as seventeen sets of rolls to reach its final shape. As the steel billet passes through each roll it speeds up as the area of the bar gets smaller, the length gets longer and therefore it accelerates, quite like rolling out pastry. This can be quite a sight when you see the glowing steel passing through the line. Each of the rolls are technically designed to not only produce the correct size product, but do it in a way that ensures the product quality, and considers the limitations of the way steel behaves, and the equipment that controls and drives the rolls. After the steel leaves the rolling line it goes one of two ways for further processing. If it is destined to be a straight reinforcing bar it will proceed to the cooling bed. The bar on the cooling bed is cut to length with the flying shear as it enters the bed. This ensures each bar can fit on the bed. Once on the cooling bed the bar cools to a manageable state and is then further processed at a cold shear where it is cut to the customer required length. The product is then bundled and labelled to provide its unique identity. 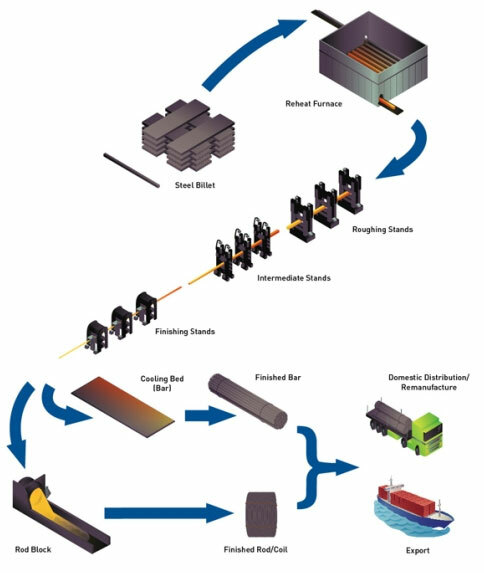 If the steel exiting the rolling line is destined to be wire rod or is reinforcing bar that is going to be sold in coiled form, then it is diverted to the rod block to be further processed rather than the cooling bed. Product that is diverted to the rod block is then rolled through a further ten sets of rolls at extremely high speed. The finished product is travelling at 100m/s or 360km/hr therefore the control of this and the safety systems are critical. The product, which is now termed 'rod or coil', is spun and delivered onto a cooling conveyor. At the end of this it drops onto a former which holds the coil while it is processed through the coil strapping station and delivered off the line where it is labelled with its identification. All of this process is controlled from the control tower which is a medley of automated systems designed to control the rolling process. From this vantage point the operator must monitor and control substantial equipment, from the reheat furnace, to the rolling line, to the rod block or cooling bed. For each product a new program is downloaded which provides the parameters for the PLC’s to control the mill equipment. The operator then takes control factoring in feedback information from the control system and being quick to respond to his own senses. Unfortunately sometimes the process can go wrong and the material doesn’t go where it should. This is called a cobble and reducing these occurrences is a key focus of the mill staff and process improvement initiatives. Pacific Steel’s rolling mill produces around 265,000 tonnes of reinforcing bar and wire rod products on an annual basis. Domestic sales volumes fluctuate, but an average mix for the business would see approximately 55-58% of this volume sold into the domestic market and the balance sold to offshore steel markets. In the final installment to our production process articles, we have outlined in simplistic terms how the wire mill makes bright hard drawn wire and galvanised wire. The key raw material for the wire mill is wire rod coils. 99.5% of the entire wire mills rod is sourced internally from the rolling mill. This makes the wire mill the single biggest wire rod customer of the rolling mill at circa 32,000 tones per annum. Prior to being drawn into a bright hard drawn wire, all the scale must be removed from the rod. Scale is like a thin skin that is formed on the surface of the steel when it is cooled. On completion of the rolling process in the rolling mill. Historically this was done by chemicals and was completed in a process called "acid pickling". That process is not environmentally sustainable and in 1999 the wire mill began trials on mechanical de-scaling equipment as technology became available. 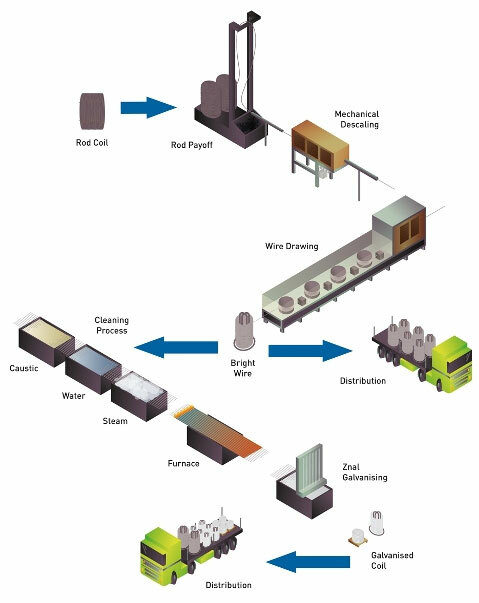 This process took approximately 8 years to finally be able to mechanically de-scale the entire product range and with great delight the "acid pickling" process was decommissioned. The scale is removed through a double system. First the coils are loaded onto a rod payoff platform that vertically unwinds the coil through a set of reverse "S" rollers. This simple process bends the rod and 60% of the scale simply breaks off and is captured in collection bins at the bottom of the payoff. The rod then travels through a second system which consists of a "DECALUB" mechanical de-scaling unit. This unit firstly through pulleys takes the rod on a 360 degree tight bend on both axis which removes another 30% of the surface scale and then the rod finally passes through two sets of wire brushes which remove the final 10% of scale. All the surface scale collected is recyclable or can be sold as is for various applications. At this stage the wire rod is effectively the same size (minus scale) and is ready to enter the wire drawing machine. There are five different wire drawing machines and each has slightly different configurations depending on what products you ultimately want. But the basic theory applies to all. The rod is passed through a serious of "dies" until it reaches the desired final diameter. The rod is not shaved, but drawn/compressed into the new size. It is very similar to what happened when you squeeze/roll "play do". The rod gets longer and longer and smaller and smaller. In simple terms if you put 1 tone of rod in you get out 990kgs of wire at the other end. There is very little lost through the process. But the amazing thing is the length that is generated. A typical 6mm rod coil (1.45 tone) when stretched out is around 6.5 km long. When this is drawn into a common 2.5mm wire the same 1.45 tone is now 37.5 km long. Pretty impressive when you think all that came from an 8.7 meter billet!! The finished product of the wire drawing is a "bright hard drawn wire" this is commonly sold as raw wire and is then used by re-manufacturers to make mesh, nails, display stands, wire ropes, shopping trolleys and various other applications. It is also used as the raw material to the galvanising plant. Galvanising wire is a complicated process and there are a number of parameters to get correct to ensure that the zinc aluminium ultimately bonds to the wire. In a simplistic approach the wire is first fed through a cleaning section. This section consists of caustic baths, hot water rinse and steam cleaning. The first two baths contain a low concentration caustic solution that removes any wiredrawing soap residue from the previous process plus any other contaminants or mild surface rust. The wire then passes through a hot water rinse, which removes any caustic carry over. Finally the wire travels through a steam pressure clean which blasts off any final contaminants and flash dries the wire. The wire is now clean and ready to begin the annealing and coating phase. The wire enters the furnace through individual tubes and will not be exposed to Oxygen or moisture again until it is coated. This is achieved by burning low pressure Hydrogen through the tubes. This stops oxides forming on the wire whilst it is raised in temperature. If an oxide was to form then the Zinc Aluminum (ZNAL) would not be able to bond to the steel wire in that area. This is called "misgalv" and avoiding the formation of this oxide is crucial to the whole process. The temperature of the furnace determines the level of annealing. A high Tensile wire is only heated to around 600 degrees and its tensile strength is maintained at a high level but it is relaxed from the hard working it received in the wiredrawing process. This returns some ductility to the wire and makes it ideal for fencing. The low tensile wires are heated to around 830 degrees which takes the wire through the magic 780 degree level which results in a significant drop in hardness and makes the wire very ductile. If it didn’t get heated over the 780 degrees the wire would be significantly harder and be more in the medium tensile range. Sometimes noticeable hard patches are evident in a soft wire and this is normally due to the wire not being consistently heated over this point. Finally the wire passes through the ZNAL bath where it is wiped smooth and the coat weight is controlled. This is achieved by using an electromagnetic field system. Finally the wire is quenched and packaged. We either make bulk coils of around 700kg that are sold to remanufactures or we package as 25 or 39kg fencing coils which go to the distribution markets. This is another example of how you can make high quality products from a fully recycled product. There are a number of vineyards now that have specified that as much of their infrastructure has to be from recycled product so they take advantage of this key material for their vineyard structures being made from recycled steel.